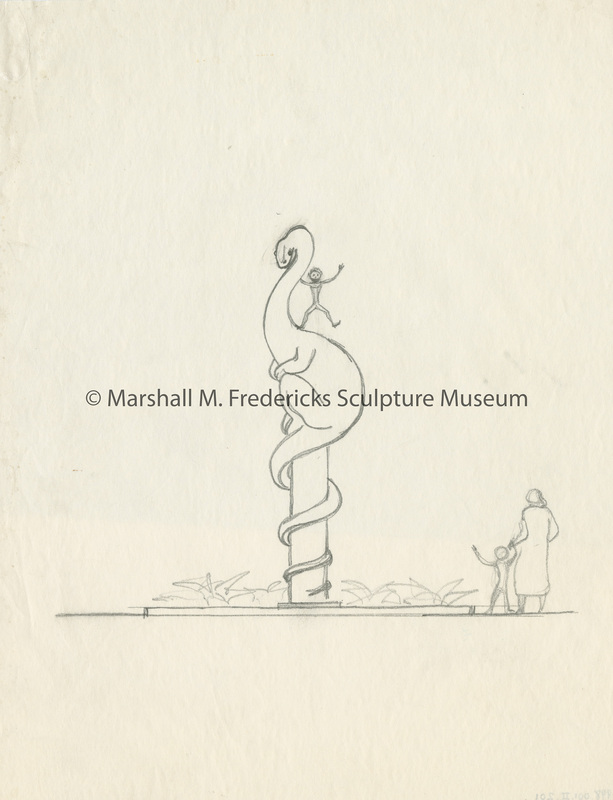 Marshall M. Fredericks Sculpture Museum | Sketch for "The Friendly Dragon"
Throughout his long career, Fredericks often returned to his joyful and whimsical work that involved animals. “The Friendly Dragon, cast twice in 1991, as a pair for the Meijer Gardens, Grand Rapids, Michigan, is a child’s magical dream. Like a Maurice Sendak illustration (popular author of Where the Wild Things Are), Fredericks’ dragon presents a danger that has become approachable, a wild animal that has become as friendly as a pet.” (Marshall M. Fredericks, Sculptor, p. 14). Sketch may also be an early concept for the sculpture outside the Holden Museum of Living Reptiles at the Detroit Zoological Institute. This Item dcterms:relation Item: Sketch for "The Friendly Dragon"
Fredericks, Marshall M., 1908-1998, “Sketch for "The Friendly Dragon",” Marshall M. Fredericks Sculpture Museum, accessed April 22, 2019, http://omeka.svsu.edu/items/show/7714.